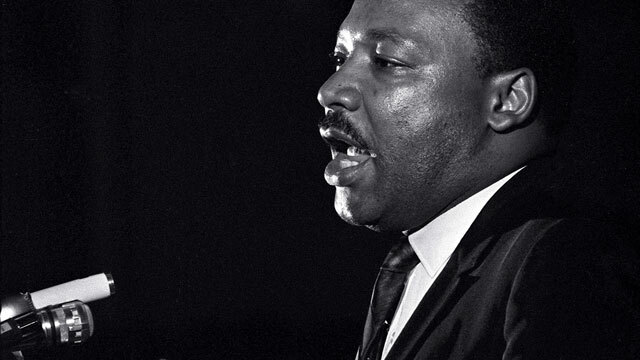 Dr. Martin Luther King Jr. makes his last public appearance at the Mason Temple in Memphis, Tenn., on April 3, 1968. The following day, King was assassinated on his motel balcony. 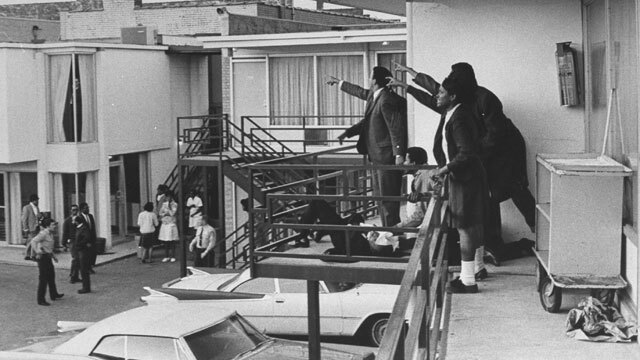 The Fatal Shot, Civil rights leader Andrew Young, left, and others on the balcony of the Lorraine Motel point in the direction where gunshots came from after the assassination of civil rights leader Martin Luther King Jr. on April 4, 1968. His body lays at their feet. As he walks through O’Hare Airport in Chicago, American civil rights leader the Rev. 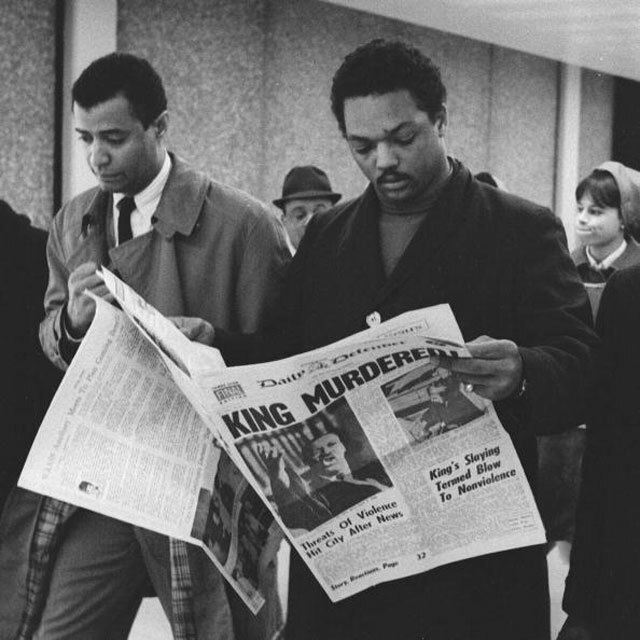 Jesse Jackson holds a copy of the Daily Defender newspaper, which features the headline ‘King Murdered!’ April 5, 1968. The headline refers to the assassination of Martin Luther King Jr. on the evening of April 4, 1968. 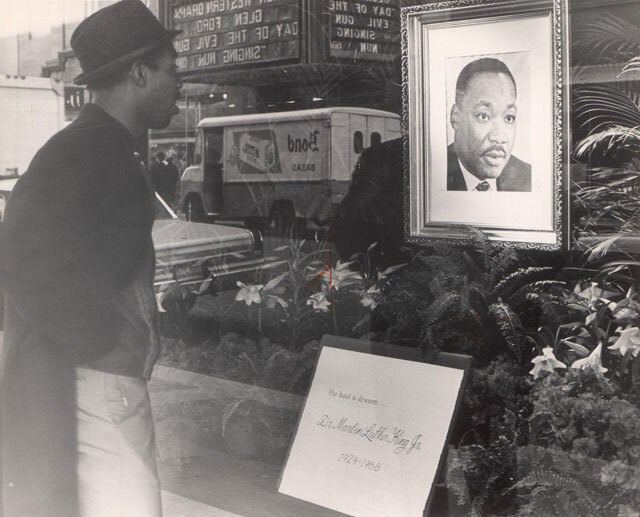 A man looks at the portrait of Martin Luther King Jr. in the window of Jordan Marsh, a department store in Downtown Crossing in Boston, on April 6, 1968. 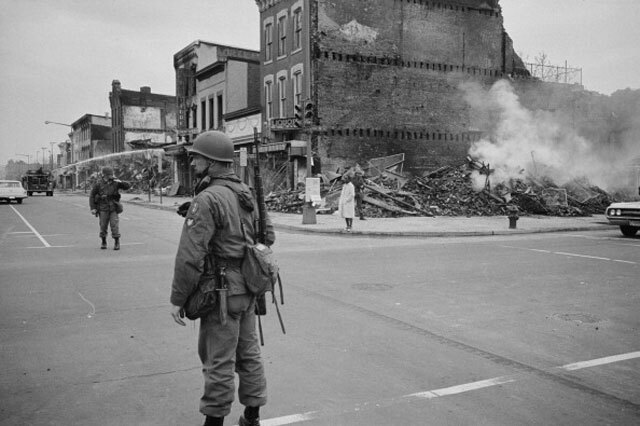 A soldier stands guard on April 8, 1968 on a Washington, D.C., street amid the ruins of buildings that were destroyed during the riots that followed the assassination of Martin Luther King Jr.
American civil rights leader Martin Luther King Jr. lies in repose in Memphis, Tenn., as his colleagues Andrew Young, Bernard Lee and the Rev. Ralph Abernathy pay their respects to him. 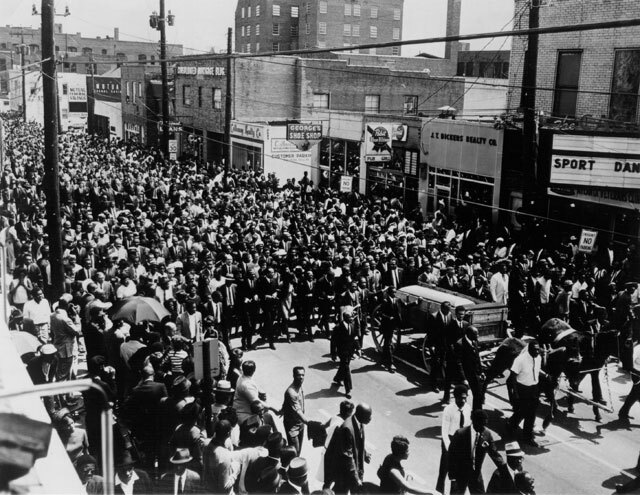 The funeral procession for civil rights leader Martin Luther King, Jr. on April 9, 1968 in Atlanta draws thousands of mourners who came to pay their last respects to King at a public service at Morehouse College. 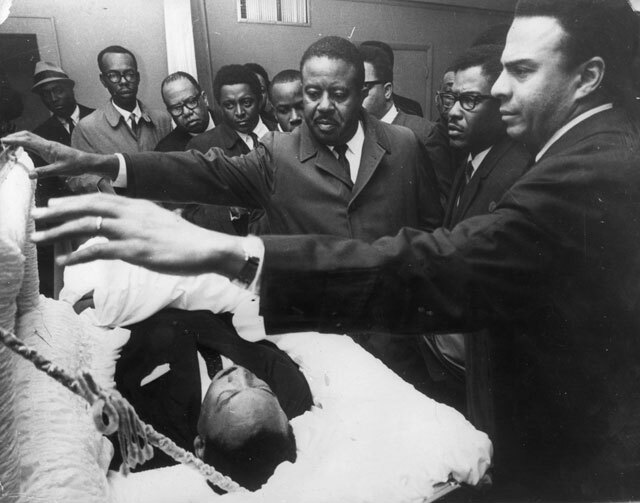 A private funeral was held separately at Ebenezer Baptist Church. 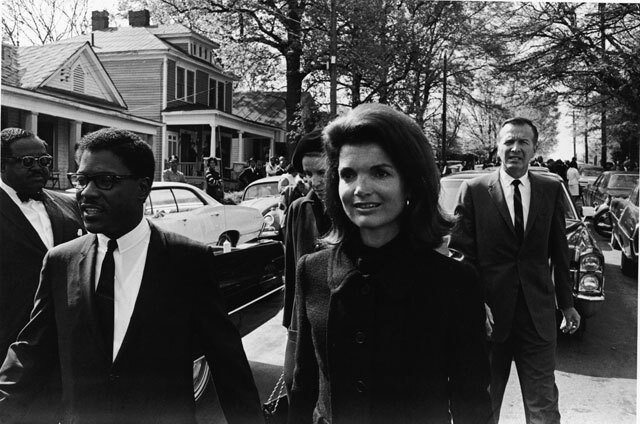 Former first lady Jacqueline Kennedy walks through the streets with American civil rights activist Bernard Lee, left, in the funeral procession of assassinated civil rights activist Martin Luther King Jr., Atlanta, April 9, 1968. The Rev. 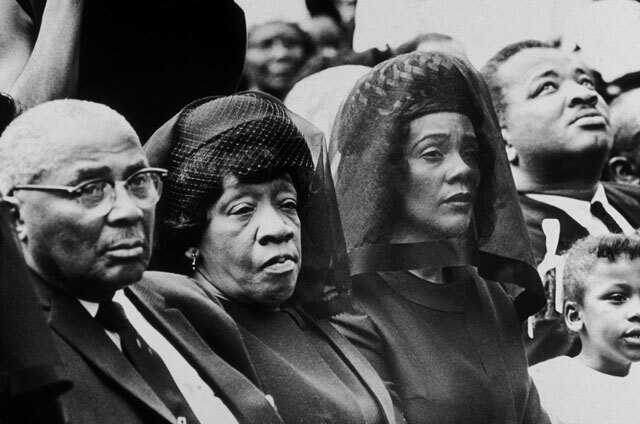 Martin Luther King Sr. and his wife, Alberta King, the parents of assassinated civil rights leader Martin Luther King Jr., and King Jr.’s widow, Coretta Scott King, listen to ceremonies at Morehouse College during a memorial for King in Atlanta, April 9, 1968. 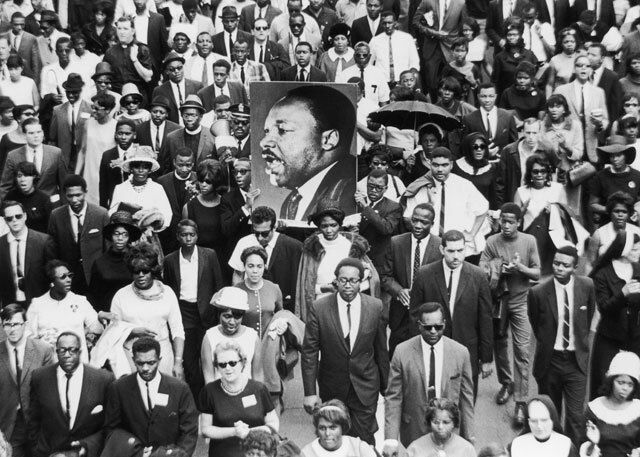 A large crowd of mourners follow the casket of Martin Luther King Jr. through the streets of Atlanta.